You can edit database data in external tools. More information about it here. Use json export/import to create database backup. 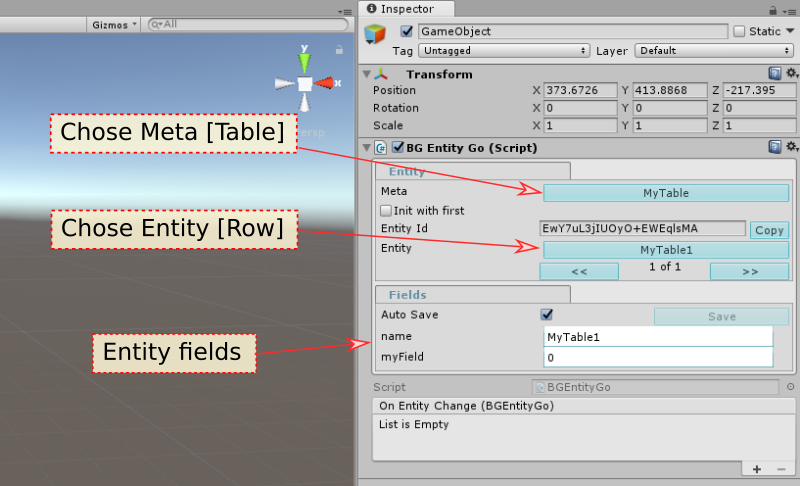 By adding BGEntityGo component to any GameObject and choosing table and row. Let's take a look at each of these methods. You can remove all boilerplate code by using generated classes. Here is the same example but written with help of generated classes. As you can see, using generated classes removes all boilerplate code and also adds compile time check in case the database structure is changed. E.g. for example, if you remove field myField or change it's name and regenerate the classes- you'll get compile-time errors, that myField property is not found. So using generated classes is highly recommended. You can easily hook up any GameObject to a database row by adding BGEntityGo component to it. Just add the component, select table (meta) and then select a row (entity) After that all fields will be immediately available for reading and writing. However in this scenario you'll have to use basic API, which has a lot of boilerplate code. So, instead of this method, we highly recommend to use method 4, described below. Apart from CodeGeneration, described in method 2, there is another type of CodeGeneration, which generates classes, inherited from Unity's MonoBehaviour class. These classes can be added to Unity's GameObject, just like BGEntityGo component, but all of them have additional properties for each table field, so you can use them instead of basic API. We highly recommend to use this method instead of method 3.